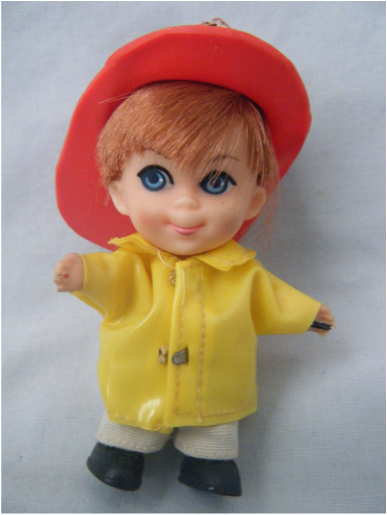 The original Liddle Kiddles were produced by Mattel from 1966-1968. 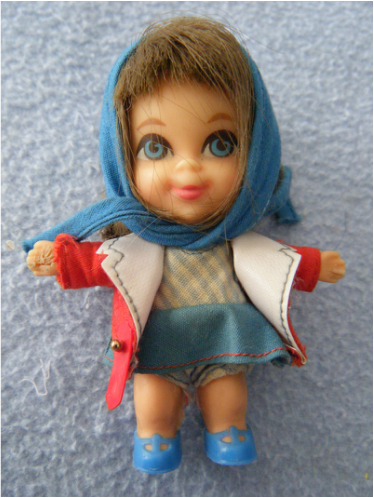 For Christmas 1966 (I was almost 5 according to the family photo in which I am receiving my Kiddle), my parents gave several of us Liddle Kiddles. 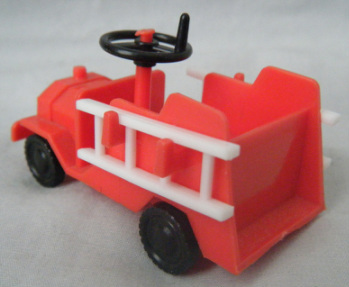 My older sister received Babe Biddle (and her ultra-cool sports car), I received Bunsen Burnie (with a fire truck), my younger sister received Calamity Jiddle (with a rocking horse), and my younger brother received Biff Boodle (with a wagon). All came with some sort of head gear as well as a hair brush and comb. They all wore shoes except for Biff. 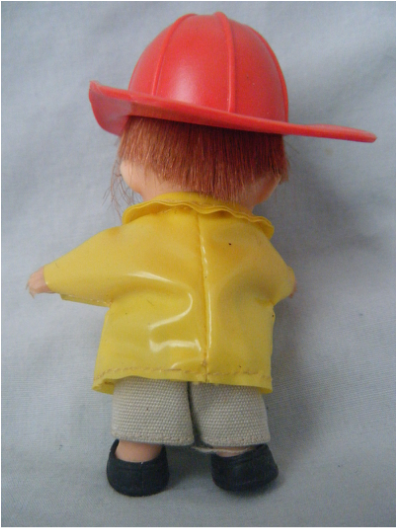 My brother and I used to love to invert Biff's cap because it was so flexible. We also used to love putting the soft rubber shoes on our fingertips - why, I have no idea. We also loved their plasticy smell - it would remind you of Christmas morning. 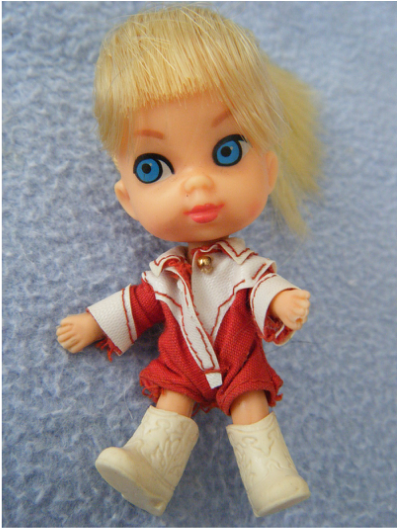 The Kiddles were posable because they had wires inside of them. Unfortunately, the more you played with them the more the wires poked out of their hands and feet causing numerous finger pricks to their owners. Once this happened, my father would march the offending Kiddle down to his workbench in the basement, take out his slim-nosed pliers, and extract the wire while we would watch, cringing in horror. After this grizzly procedure, the Kiddle was less fun to play with because it could no longer strike a pose. My father did wireless long before it became popular. Usually the boys were not allowed up in the girls' bedroom on the second floor without special permission. Playing Kiddles was like getting an engraved invitation. The girls were in possession of a two-story doll house that we all used when playing Kiddles. 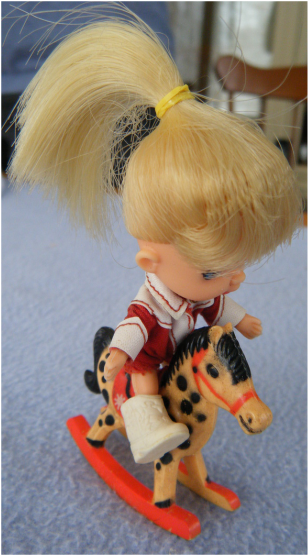 We boys usually lost interest in well-mannered play fairly quickly and would either have our dolls do reckless boy things (like leap over tall doll houses in a single bound) or we would start jumping or rolling about on the bedroom floor (shaking the first floor ceiling). Either the sisters, or the parents, or both, would then evict us from the second floor. 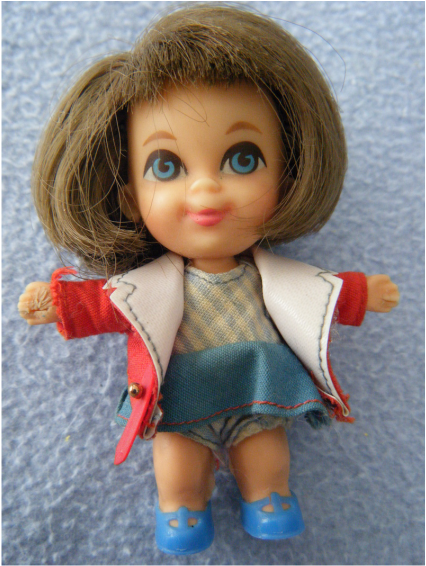 At some point in my pre-teen or early teen years, I must have thrown out Bunsen Burnie, while doing a routine purge of broken or outgrown toys. When I confessed this unspeakable act to my sisters (in my forties...) they were both appalled and saddened. For my birthday, they surprised me with a replacement Bunsen Burnie they had located online. Amazingly enough, he still has his fire truck and wires! I had to quickly hide him from my father who started to get that surgical gleam in his eyes. Bunsen now resides in his own display case in my home office (on the second floor) - a fun reminder of my distant past. Bunsen is still in his package in the foreground as I am opening Christmas presents in 1966. I used to pretend that Bunsen drove the sports car I am holding in my hand since he had to keep up with my older sister's Babe Biddle. My younger sister is taking Calamity Jiddle out of her package in the background. Bunsen Burnie (the new one). 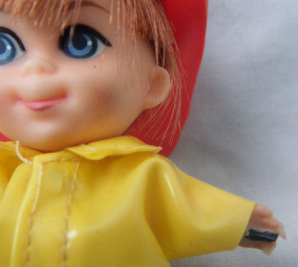 His cheeks look a little sooty - I don't know if that was by design or from play. He is not wearing a shirt under his slicker. His trousers do have a little button. Bunsen had a real occupation unlike most of the other Kiddles. 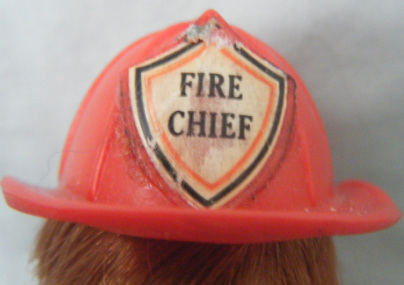 I always thought it was cool that Bunsen was a Fire Chief like my uncle. Here is Bunsen's fire truck. 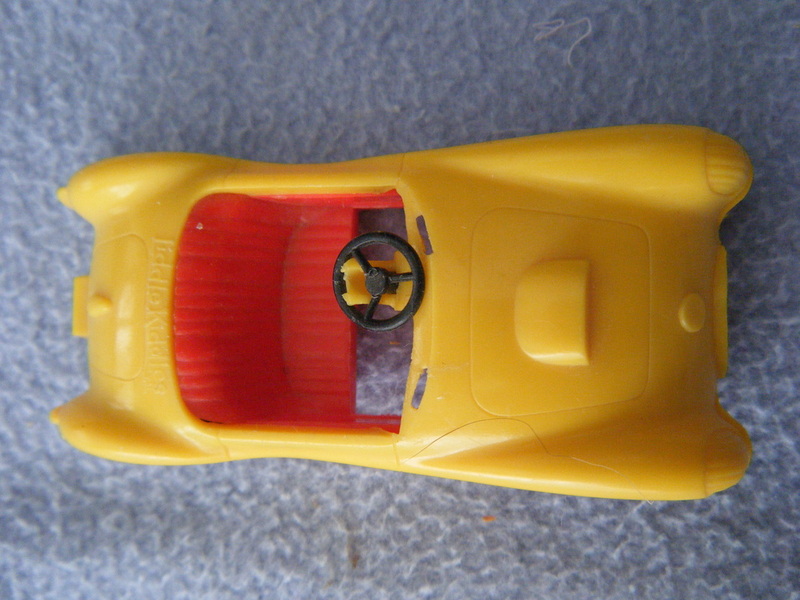 I always thought that the steering wheel was cool - too bad it didn't actually turn the vehicle. My older sister's original Babe Biddle. 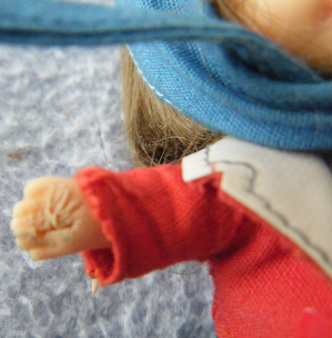 Poor Babe - her hand bears the scars of wire removal. I was very jealous of the sports car. I pretended that Bunsen was able to drive a Corgi car I received for Christmas that same year. My maroon car was cooler because it had opening and closing doors and trunk. Better yet, Bunsen could carry his brush and comb in the trunk. About a year later, my older sister received "Slipsy Sliddle". She has managed to retain her wires - we must have gotten wiser after the first few surgeries occurred. My younger sister received Calamity Jiddle on the same Christmas that I received Bunsen. Calamity came with a black felt cowboy hat. My sister still has it but it has lost its shape. 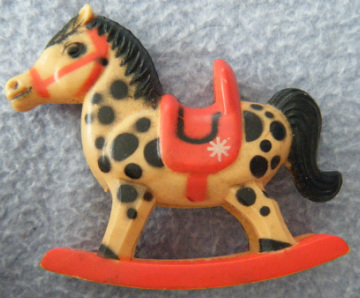 This is a replacement rocking horse for Calamity. The original became very faded. 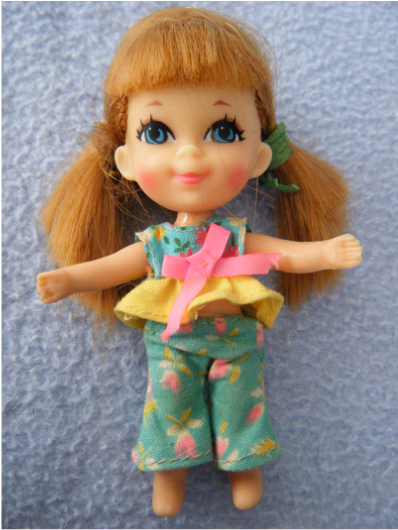 My younger sister received this Kiddle at or around the same time as my older sister received Slipsy Sliddle. None of us can remember her name. According to my sister, she came with a pink outfit and she made her own. As near as I can tell, from the facial expression and pink outfit, this must be Beddy Bye Biddle but we don't remember the bed that the doll would have come with. In keeping with his fireman persona, Bunsen has red hair. My replacement Bunsen did not come with brush and comb, so I have to hope he does not come down with a bad case of hat hair. Take a close look at Bunsen's hand. He has a protruding wire. I vow not to have surgery performed on this Bunsen. 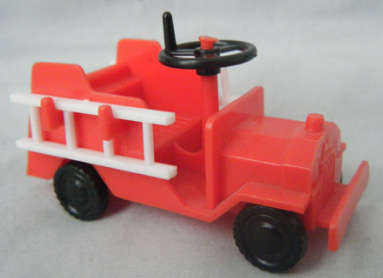 The fire truck was great when playing with the doll house. My Kiddle could perform daring rescues with his ladders that almost reached the first floor windows. 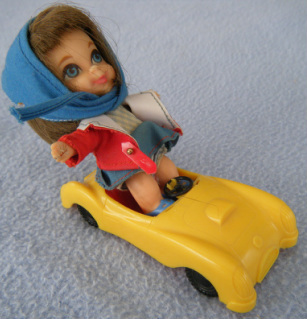 Babe has a headscarf for riding in her sports car. Since Babe is missing her wires, she can't sit in her car. This is a very hazardous way to drive. Notice the clear plastic windshield is missing. 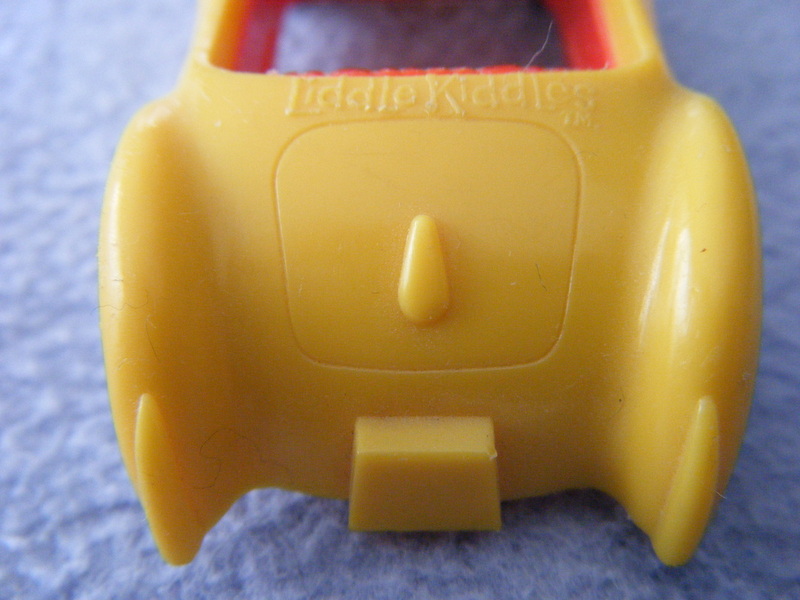 The Kiddles logo appears on the back of the car. 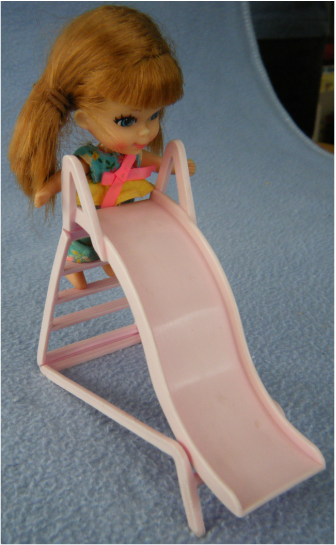 Slipsy came with a pink plastic slide. This was a big hit when we played with the doll house. 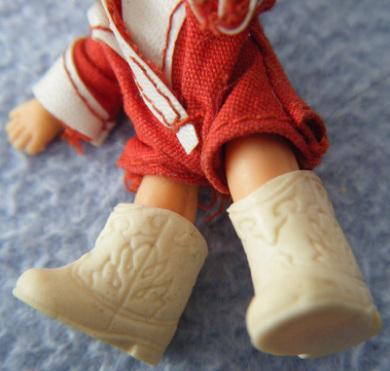 Calamity had the coolest footwear. Naturally, our Kiddles tried on each other's shoes. Poor Biff came barefoot. I seem to recall that my younger brother tried to negotiate a trade for the cowboy boots. Negotiations must have failed. Calamity can still ride with the best of them. My sister used to wear her hair just like Calamity. When I was doing the photo shoot for this page, I asked my sister to put Calamity on her horse. 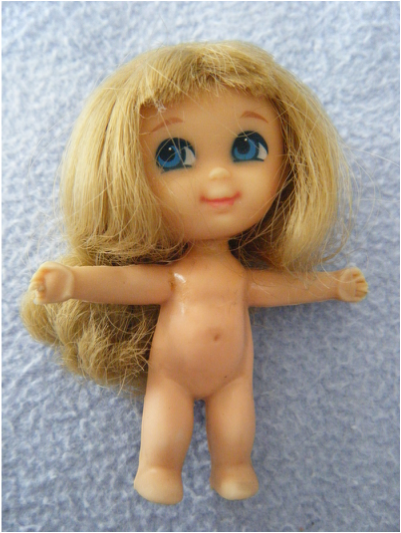 When she bent the doll's leg, the rubber broke. Calamity was pretty stoic during the event - I started shrieking. Thank goodness the leg wire was still in place or she would have lost the leg completely.